Loom Madness has taken over South African. Hurry up and join in the craze. 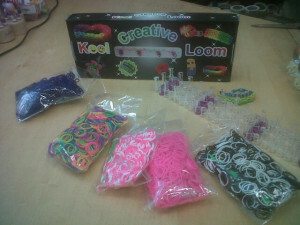 Get your Creative Loom Kit and exciting wide variety of colourful elastics. The Loom Kit includes 1 Loom Board , 600 Colourful Elastics, 24 Clips and 1 Hook.